Dr. Sarah Cramer has come a long way from being caught skipping in the hallways of Gentry Hall by her advisor, Dr. Anna Hall. 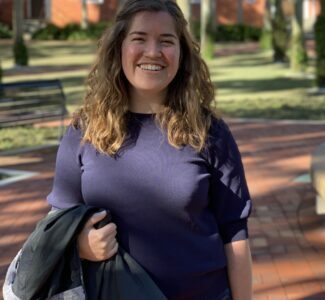 The recent Mizzou alum has now found her new home as a Brown-Teacher Scholar in the Department of Environmental Science & Studies at Stetson University but she still holds onto the support and encouragement that she received here at MU. “We hear so many horror stories about grad school, but that was never my experience. I really looked forward to walking into Gentry Hall every morning and sometimes I literally skipped out of my office door and into the hallway. I loved my time in graduate school at MU. My fellow graduate students were wonderful, and I could not have asked for better faculty mentors or committee members. I was given both support and freedom to explore my academic interests, and I graduated equipped with the tools to be the best new faculty member I could be,” says Cramer. A recent graduate of the Division of Applied Social Sciences (DASS), Agricultural Education & Leadership Department, Cramer continues to take everything she learned about agricultural education at MU and adapts those practices and philosophies to a small, private, liberal arts school. However she credits her involvement with the MU Star Grant Program as the one thing that assisted her in the transition from grad school into academia. “First, the program funded the development of the “Seeds of Equity” course, which I taught at MU and am now teaching at Stetson. Additionally, the STAR funds allowed me to attend the Sustainable Agriculture Education Association conference in Hawaii last year to present the findings of our research on the innovative teaching methods utilized in the class. This was a valuable opportunity to connect with others in my field, and one that would not have been possible without the STAR funds,” says Cramer. During her time at MU not only did Sarah receive the tools and support necessary for her to enter into the world of academia but she also managed to give back as a beekeeping mentor with Sustain Mizzou Beekeeping while facilitating community-engaged learning opportunities for students in food and agriculture. But she describes that her most significant moment at MU is one that she continues to take along with her as she begins her new journey as a faculty member at Stetson University. “The most rewarding part of my time in graduate school was designing and teaching a brand-new course on race, class, and gender in the food system with fellow graduate Dr. Leslie Touzeau and Dr. Mary Hendrickson. I continue to teach a version of this course in my current position at Stetson, and I am honored to be able to give voice to some of the marginalized populations on whom our entire food system depends,” says Cramer. It was also the class she taught on race, class, and gender with Dr. Touzeau that served as the focus of the MU STAR Grant program. Today, Cramer continues to examine the transformative potential of elementary school gardens within both the food system and the public education system both inside and outside of the classroom. “At Stetson, I continue my beekeeping mentorship outside of the classroom by working with the Stetson Beekeeping club, and I am developing a new first year seminar course to teach in the fall all about bees! I also incorporate gardening into my courses, advise the campus gardening club, and work with Campus Dining to facilitate experiential learning – like just this week when my food systems practicum students packaged 101 pounds of leftover food for delivery to a local community resource center as part of the Food Recovery Network” Cramer explains. And while she may not be skipping through the hallways of Gentry Hall, Cramer says, “I still frequently skip out of my office because I’m just so happy I get to do this for a living”.